This whimsical bead and wire collaged design is a dramatic statement in contemporary ethnic style. Twin carved kitties are woven among carnelian, turquoise, coral and crystal beads, upon a linked two-piece hammered brass base. 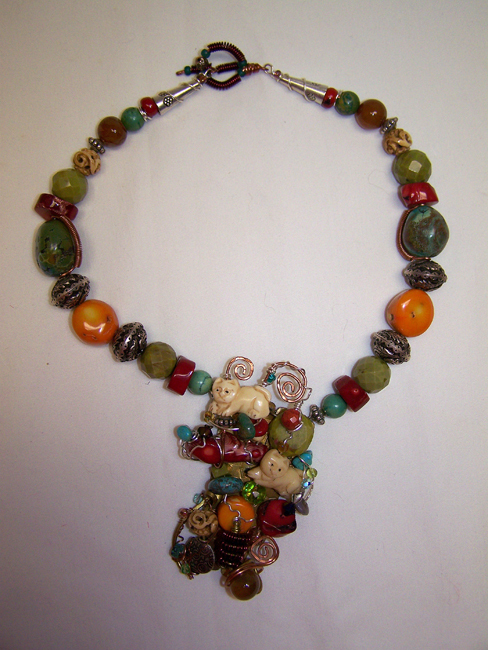 Large chunks of turquoise and coral complete the necklace. Hand-made toggle clasp. Pendant piece is 2" by 4". Necklace length is 16" plus pendant drop. Looks equally gorgeous with jeans and a denim jacket as with a classic black dress. Pendant is stamped with the artist mark.